Celebrating a Bond of 2 Successful Years! It feels like just recently we stepped into the Beaver Builder community and you welcomed the Ultimate Addons for Beaver Builder with lots of love. And, today we complete 2 years! Today I take this opportunity to thank you for your continued love and support. In this post, I’ll be focusing on a few things that kept us going and a few more that you can no longer wait for. Being the pioneers of page builder addons, we knew our user requirements and were focussed on delivering them. This is something that brought us through the first year. The second year was mainly about standing up to your expectations and receiving all the love. Just like the first year, we continued getting lots of love through messages, tickets and yes, the FIVE star ratings on the WordPress repository. The Ultimate Addons for Beaver Builder soon bloomed to be the most popular and loved Beaver Builder addon with 180+ 5 star ratings, 80K+ active websites and over 15K+ customers today. Change is the only constant. And we believe in updating our products and the way we present them to you. So, here we are with a new logo and a new website for UABB. The Ultimate Addons for Beaver Builder has been the best Beaver Builder addon crossing over 15000+ online users relying on it. We are proud to have contributed to creating 80000+ beautiful websites for different niches across the world. UABB along with Beaver Builder has helped people create wonders online! We introduced free full website demos that can be imported and used directly as starter sites. This is our way of contributing to the community. These free website demos are built with free plugins and therefore you do not need any premium license to use them directly. We built the best and fastest WordPress theme that works great with Beaver Builder and the Ultimate Addons. This gives you the best possible environment to build beautiful websites! One year down the line, Astra is being used on over 90,000+ active websites. Considering many of you who wanted to use the premium starter sites along with Beaver Builder, the Astra theme and the Ultimate Addons for Beaver Builder, we created a new package called the Mini Agency Bundle. You can now own our Agency products specific to your favorite page builder. For all the Beaver Builder users we present a bundle in which you get the Ultimate Addons for Beaver Builder, the Astra Theme Pro Addon, WP Portfolio plugin and premium starter sites. We understand that most of you already own and love the Ultimate Addons for Beaver Builder. For those of you who wish to upgrade from any one or two products that you have purchased from us, we have the easiest upgrade options in which you simply need to pay the difference. You can read more about the Mini Agency Bundle in the introductory blog post. Taking things forward, we want to continue serving you with the best Beaver Builder modules and features you’ve been looking for. We are working on a list of modules that will be included in UABB itself and you need not pay anything extra for it. Take a quick look at what we are working on. The best part of these modules is that they come within UABB itself without paying an extra cost. All these will come as a part of the parent plugin and you will be able to activate and deactivate them just like the ones before. With the focus on creating beautifully designed full website demos and templates, we aim to help you build eye-catching websites faster. These starter sites are created using our Astra theme, Astra Pro addon, Beaver Builder, and UABB that are included within the Mini Agency Bundle at an affordable price. We are working on creating many more such premium websites to help you deliver websites faster and make more out of the time you invest. 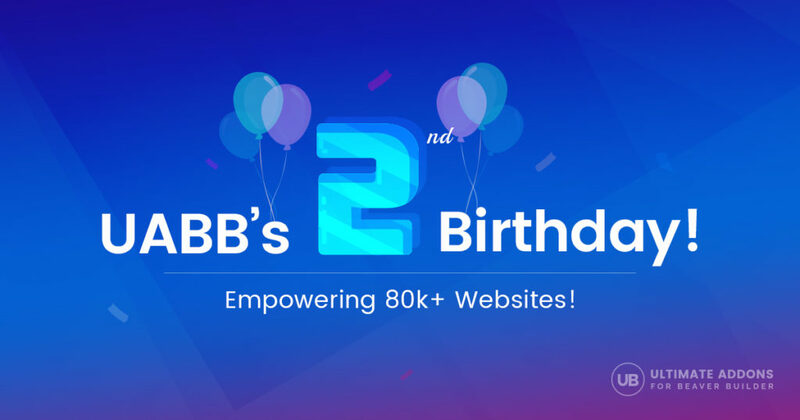 To mark our Birthday and celebrate the bond we’ve shared in these couple of years, we are offering a 20% discount on all our plans and upgrades. The coupon code will be auto applied from the pricing page on the website. Thanks for sharing the post about ultimate add-ons for beaver builder second birthday sale.